Auto dealerships have had to adapt at a rapid clip over the past decade as digital platforms have overtaken traditional media as the primary mechanism for reaching auto shoppers. The role of print ads has rapidly diminished, replaced with tactics like geo-fencing, search engine marketing, social advertising, and website retargeting. A marketing plan that might have included just television and newspaper ads less than 10 years ago now must extend across at least half a dozen other platforms. Keeping messaging consistent across all of these platforms is essential, but often overlooked. Luckily, there’s an excellent free resource available that help. Among Google’s many excellent resources for businesses, Google Trends is perhaps the most fascinating. The tool reports on search trends and interest in topics, provides related terms being researched, and allows comparisons of them from a global level, all the way down to metropolitan areas. It’s a virtual treasure trove of actionable intelligence for creating a data-driven and highly cohesive cross-platform advertising strategy. For today’s purposes let’s say a Volvo dealership is in need of a marketing strategy overhaul. With fragmented messaging from one platform to the next, they want to create a better experience for their consumers and a more efficient advertising model for their bottom line. Let’s run through the Google Trends reporting that can help. The first step is to search the make at the national level in order to identify overarching trends. Looking at the search term “Volvo”, we can see diminished interest over time, which is reflective of a slight sales slump the dealership has experienced. Overall the Volvo brand is struggling, so the time is right for dealerships to tighten up the advertising strategy and creative efficiencies. The related topics section provides window into the connected topics that consumers are actively researching and learning more about. The top related topics are the most popular topics ranked by how commonly they are searched. Rising related topics indicate tending terms that have has a significant increase in search volume. The term “Breakout” indicates topics that are currently being searched they may have had very minimal or no prior searches. Up next is the related queries data. This gets a bit more granular than the related topics by showing the actual search queries that consumers are entering to find out more details related to the overarching topics. Top related queries are the most popular search queries. Leverage data in the rising related queries report to ride the wave of popularity for specific search. Ensure the breakout related queries are included in your Paid Search campaign and integrated into your dealership’s blogging strategy. The level of data available at the local level with vary depending upon population and search trends within the specific area. In some cases related queries can include competitor’s dealerships or reference specific localized promotions. An entire media strategy can be easily devised by using Google Trends data to develop an impactful campaign the speaks directly to the consumer because it is linked to the topics they’re researching and search queries they’re performing. As a rule of thumb, use the topics & related topics reporting to ensure there is coverage across popular and trending terms, then within each topical area use the related queries reporting to provide definition tot he messaging across platforms. Interested In Receiving a Complimentary Google Trends Report? ThirdAuto.com Founder & Editor, Brian Rogers, has years of experience in digital marketing and is an auto enthusiast who knows the industry inside and out. 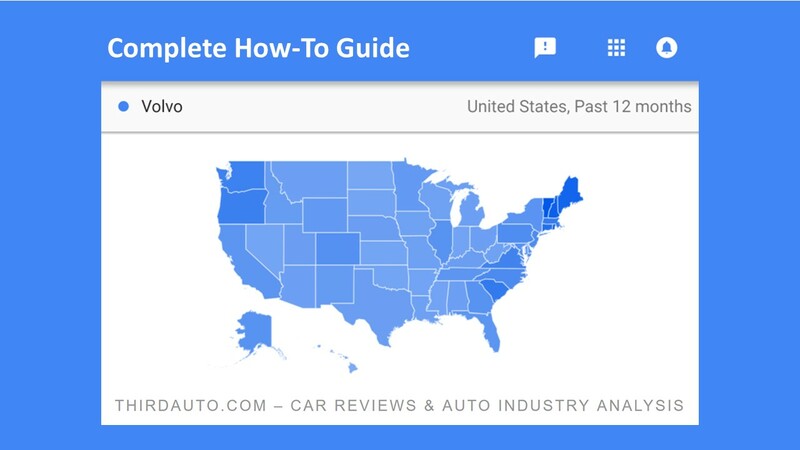 Learn more about Google Trends with a complimentary one sheet that identifies opportunities for your dealership to leverage and inefficiencies to eliminate. Use the insights provided to create a digital campaign that resonates with consumers and drives revenue. Contact us below to receive a complimentary Google Trends report and analysis. Please allow 10 business days for report delivery.